The Azerbaijani language will be taught in China for the first time. The Beijing University of Foreign Languages will train specialists on Azerbaijani language upon the decision of China’s Education Ministry, Azertac reported. “Teaching and training of the Azerbaijani language specialists will promote deepening of bilateral relations between the two countries,” a pro-rector of University stated at the event held on this occasion, noting that this will help to closely recognize the culture of Azerbaijan. Charge de-affaires of Azerbaijani embassy in China, Matin Mirza stressed that after the Azerbaijani President visited China in 2015 the bilateral relations between the counties have reached a new level. He expressed readiness to render every assistance and on behalf of the Embassy presented relevant books in Azerbaijani language to the University library. 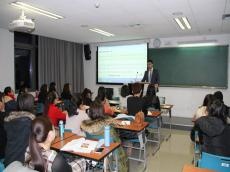 Beijing University’s teacher of Azerbaijani language, PhD Agshin Aliyev spoke of ancient ties between Azerbaijan and China, noting that 22 students of University have already chosen the Azerbaijani language as the second language. He mentioned that in the period of 2020-2021, students will be admitted to study Azerbaijani language, for what appropriate technical and teaching base will be created. The teaching base will include text-books, dictionaries, methodical aids and handbooks. Azerbaijan and China are enjoying good relations in different fields. The two countries opened a new page in their relations after President Ilham Aliyev visited China in December 2015. During the visit, several meetings, negotiations were held and 10 documents were signed. Cooperation issues almost in all spheres were discussed.